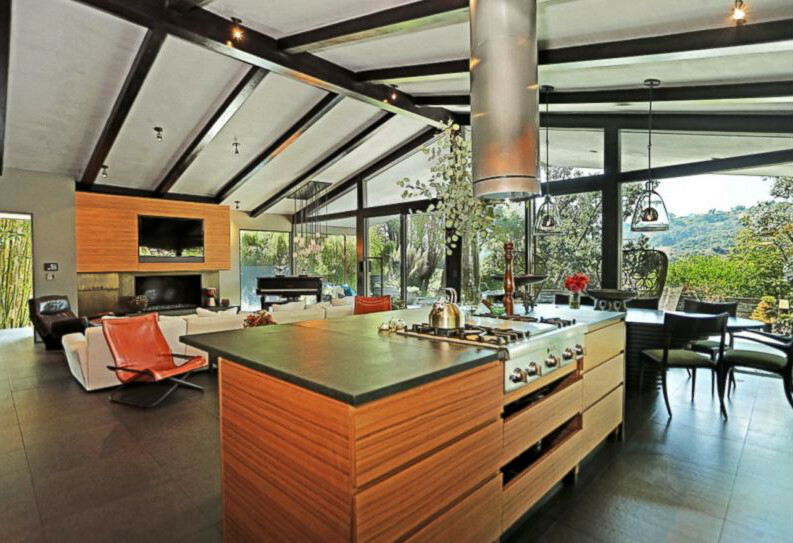 Singer/songwriter John Legend and his wife, the model Chrissy Teigen, have been busy nesting in two houses — a mid-century home in LA plus an urban loft in New York. Both homes are highly designed with large, open-plan kitchens. For Legend and Teigen kitchens are especially important because the couple cooks together — a lot — and they entertain. Teigen even has her own food blog, Sodelushious, and has an upcoming cookbook. Both the Legend-Teigen houses were decorated by Don Stewart, of Desiderata Design in L.A. and no sooner had the couple’s NYC apartment hit the cover of Architectural Digest, it was put up for sale. 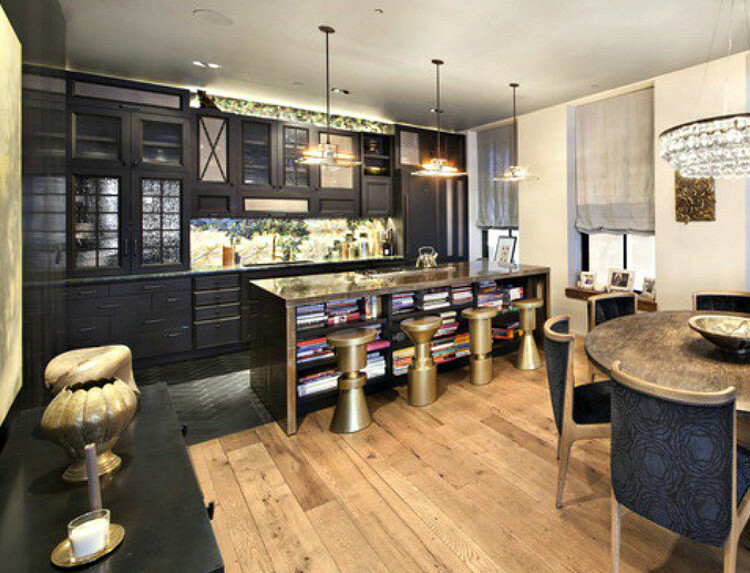 The loft kitchen [above] is a stunning blend of a dark and modern style with industrial overtones and great details. 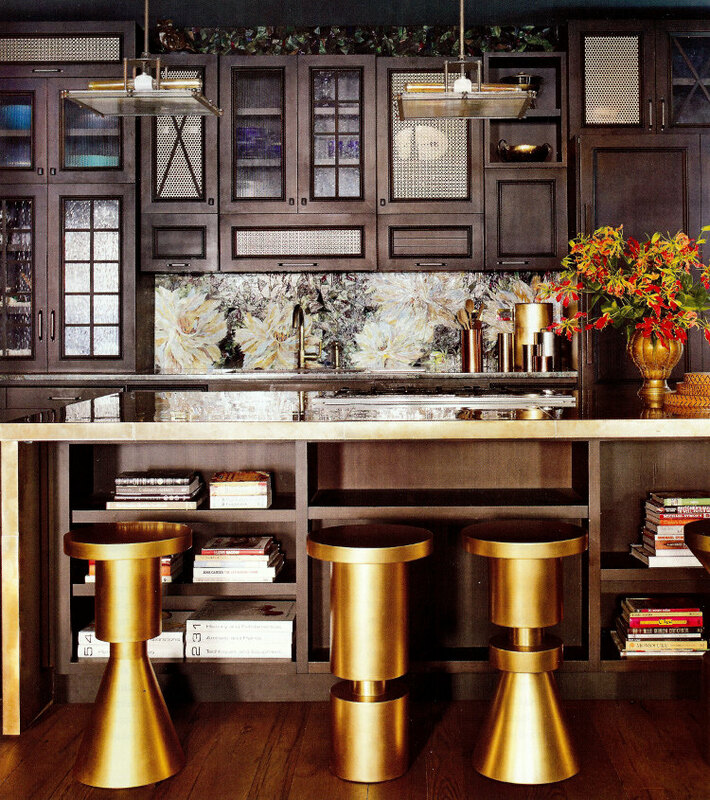 The bronze-clad island boasts a Bertazzoni cooktop and seating directly across on knockout custom Anna Karlin steel and brass stools inspired by chess pieces from Atelier Courbet in New York. The sink wall of Java-tone kitchen cabinets has a sampler-quilt of doors styles including seeded glass, slats, mesh and solid panels that creates a play of light and dark. 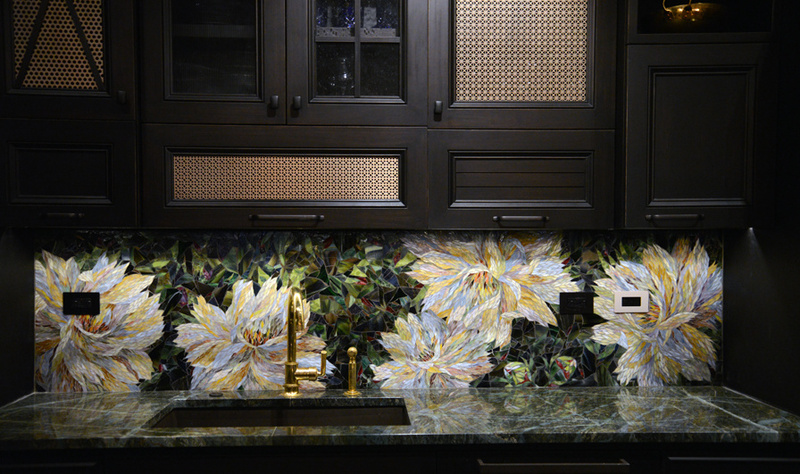 Otherwise, the intricate custom “Peony Impromptu” glass mosaic by Yulia Hanansen of Mosaic Sphere Studio, would dominate the room. Instead, it blends in like a piece of art framed by sophisticated sculptural cabinets instead of merely looking like the usual tile. 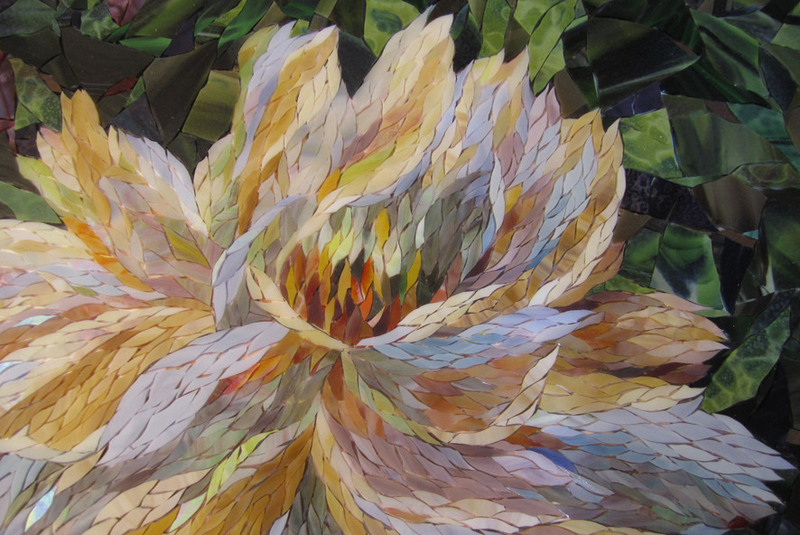 Close up, the floral glass mosaic is both intricate and intriguing. While a trifle baroque for my taste it suits the kitchen’s quirky mix and is anything but expected. A dining table is a few steps away. On the left coast, another open kitchen has Asian accents, a nod to Teigen’s heritage. 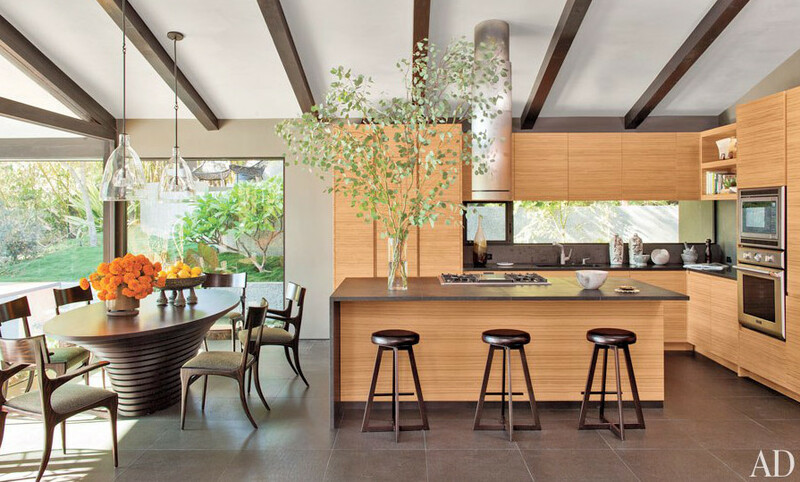 Rift-sawn teak minimalist cabinets are topped by dark basalt counters all around. The spectator stools are by Emmerson Troop. Like many mid-century houses, the sink wall lends itself to a linear glass window between upper and lower cabinets that provide a view outdoors. Here too, the Thermador range top is set into the working side of the island with convenient pull-out drawers below — to provide quick access for the cook. Above is an unusually sculptural tubular island vent hood which blends surprisingly well into the beamed ceiling. With two kitchens under their belts it will be interesting to see what Legend and Teigen do next. She has been quoted as saying they were looking for a larger home because they want to start a family. So it’s logical to expect a big family kitchen to follow.